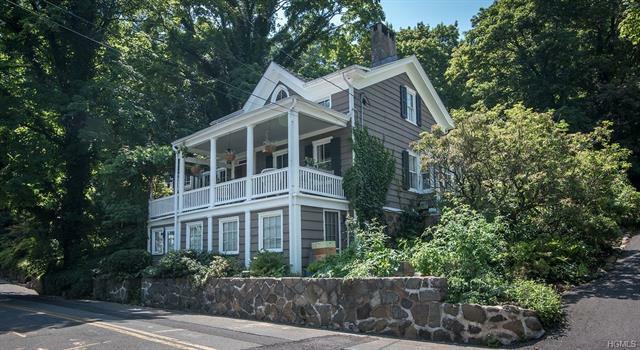 This iconic 1818 Piermont home has it all: location, Hudson River views and modern amenities. Meticulously renovated in 2010, with special attention to light, privacy and flow. Gorgeous new kitchen features granite countertops, Downsview cabinets. River views from dining room, grand master suite with soaring ceilings & room for king-sized bed, Living room includes original 1930&apos;s stone fireplace, new wide plank oak floors. Second spacious master suite/guest room upstairs is easily be converted back to two bedrooms. Plenty of storage with a spacious walk-in closet, separate linen/storage area and a recessed desk/flat screen TV space that can also be easily converted into a third upstairs closet. The home is heated by a state-of-the-art Water furnace geothermal system for year-round heat and air conditioning comfort.